No existing WiFi, Internet or cell connection required. Use in the middle of the woods! 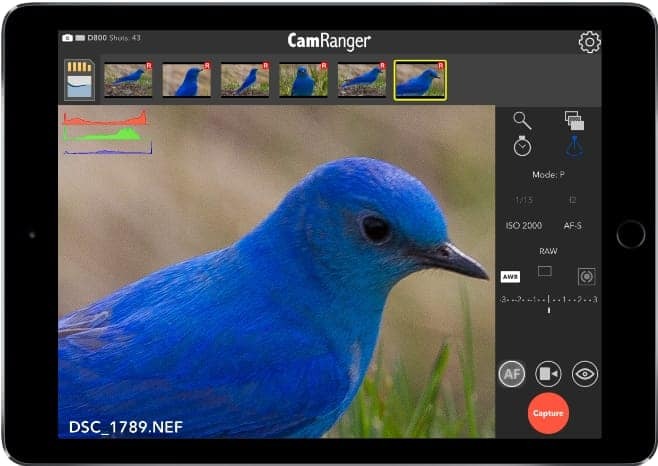 I love CamRanger. Without it I would not be able to achieve the results I do. And, it is so well made that a big lion couldn’t wreck it!!! The Ruby Throated Hummingbird and the Eastern Phoebe were easy shots, using “Live View” with the zoom-in feature of CamRanger really worked well for focusing. What a great product!! I set up my camera (Nikon D600) on a tripod in the kitchen and pointed it at our bird feeder outside the window. Then I retired to the living room (which is not in sight of the kitchen) so I could watch the football games on TV. I used LiveView on my iPad to watch for birds landing on the bird feeder, would set the focus, and then clicked a few pics. I did this for about five hours and did not miss a thing from the football games and got lots of great pics of the birds on our feeder. What a cool way to spend the afternoon. I’ve tried other wireless tethering products before getting hold of the CamRanger. It’s user-friendly interface, range of camera compatibility, plus the unit’s small, lightweight dimensions makes it perfect for my remote-control camera platform. It is worrying enough that your subjects have the potential to destroy your gear, so not having to worry about the reliability of your wireless connection allows you to better focus on what you are there for – getting unique shots of them. Shooting large live fish in strong ocean currents is a recipe for chaos. The CamRanger enables my assistant to change settings, focus, and fire the camera from within the boat while I swim with the fish, and compose the shot. Sometimes I still run everything from the camera, but the CamRanger gives me another way of managing the chaos when things get crazy.